1,800 will ring in the New Year inside 800 units of affordable housing created by the city in 2018. Mayor Ted Wheeler assembled an arsenal of statistics showing progress to place more Portlanders in government-supported affordable housing units during his year-end news conference at City Hall. At the top of his list: Some 1,800 people will ring in the New Year under the roof of one of 800 units of affordable housing orchestrated by city officials this year. The city hopes to create another 1,000 units in 2019. Flanked by Housing Bureau director Shannon Callahan and the Joint Office of Homeless Services' Marc Jolin, the mayor told reporters he believes homelessness is not a perpetual problem in society and that a solution can be achieved. "On the sticks and bricks side, we know we have the resources for at least the next year and beyond," he said Friday, Dec. 14. "The real question is how do we work collectively." • Five projects have been identified since the $258.4 million Portland Housing Bond was approved by voters in 2016, for a total of 630 units completed or in progress. • In its first 18 months, the Inclusionary Housing requirement has spurred private developers to create 362 affordable units across 43 projects. Callahan says it would have taken $32 million to create the equivalent in public projects. 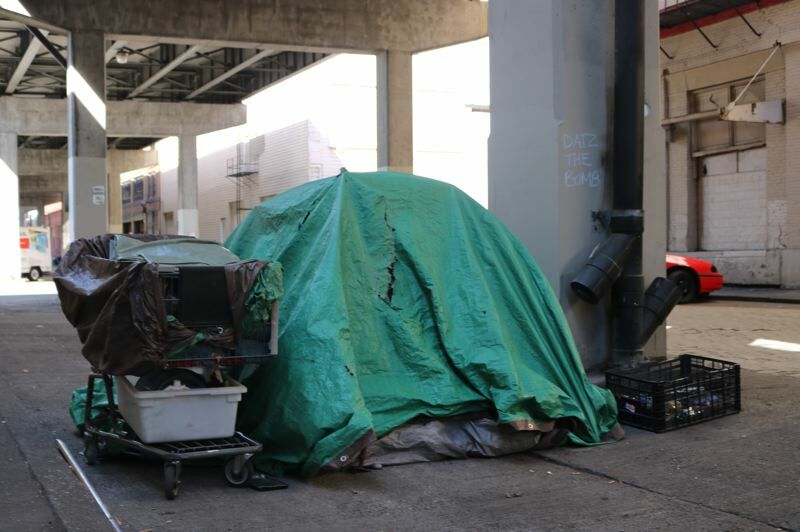 • Jolin said the Joint Office, funded by the city and Multnomah County, helped move 5,900 people out of homelessness this year, including 470 veterans, 2,800 women, 700 seniors and 1,900 children under the age of 18. "The effectiveness of the homeless response system depends on the availability of housing," Jolin said. The mayor said an expansion of the city's Rental Services Office may be on the horizon — noting that "six people" can't do it all — and praised a Multnomah County proposal that will reflow some tourist tax dollars toward homeless services. "It's a matter of the political will and resources. I'm convinced we have the right formula," he said. During the Q&A portion of the meeting, Wheeler doubled down on his support for the Joint Terrorism Task Force. "We would be out of the loop on information that impacts the safety of people in our community," the mayor said. Wheeler plans to discuss the proposed pullout during a private meeting with Hardesty this month. He has met privately with FBI officials to discuss next steps if the city leaves the task force, but thinks the best solution is to solicit testimony from the public at City Hall sometime early next year. The Portland Police Bureau coordinated with the JTTF after "numerous" local businesses reported receiving bomb threats and demands for payment on Thursday, Dec. 13, part of a nationwide scare and email hoax. Officials said none of the local bomb threats were credible.